Andrew R. Ruis, PhD, will speak on April 4, 2019 at 2:00 ET in the Lister Hill Auditorium at the National Library of Medicine on “Networks of Statisticians and the Transformation of Medicine” as part of a panel. This special program Viral Networks, Reconnected reunites three scholars who participated in the January 2018 Viral Networks workshop at NLM—funded by the National Endowment for the Humanities through a grant to Virginia Tech—to share the progress of their research and their thoughts about the future of the digital humanities and the history of medicine. Circulating Now: Tell us a little about yourself. Where are you from? What do you do? What is your typical workday like? 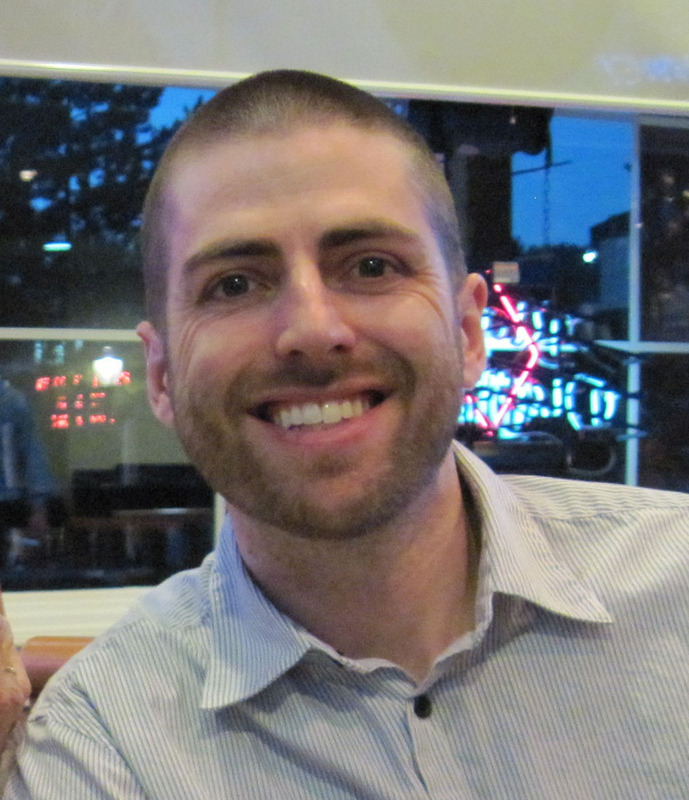 Andrew Ruis: I am a historian of medicine and a learning scientist at the University of Wisconsin-Madison, where I am the Associate Director for Research in the Epistemic Analytics Lab at the Wisconsin Center for Education Research. Our lab develops research methods and techniques that enable people to make meaning from large amounts of rich qualitative information. CN: Your chapter in the newly released Viral Networks book is titled “’Trois Empreintes d’un Même Cachet’: Toward a Historical Definition of Nutrition,” would you tell us a little of what you discovered about changing definitions of nutrition? AR: We often think of (human) nutrition becoming more tightly focused, more biomedical, and more restrictive over time. When most people think about nutrition today, they think calories, protein, fat, vitamins, and so forth. This is a conception of nutrition that is highly specific to the chemical constituents of diet, and in many respects, the field of nutrition has come to emphasize these aspects over others. Yet my analysis of how experts in nutrition and related fields have defined nutrition over the past 200 years shows exactly the opposite trend. For much of the 19th century, nutrition was a subfield of physiological chemistry, and thus very tightly focused. In the late 19th and early 20th centuries, definitions expanded to include many health-related issues, and by the 1960s, a more ecological concept of nutrition became common, stressing the effects on nutrition of relationships between humans and their environment. One of the goals of my broader work is to understand why, as nutritionists were devising ever broader understandings of nutrition as a concept, its applications became ever more constrained to the relative amounts and interactions of various micronutrients. 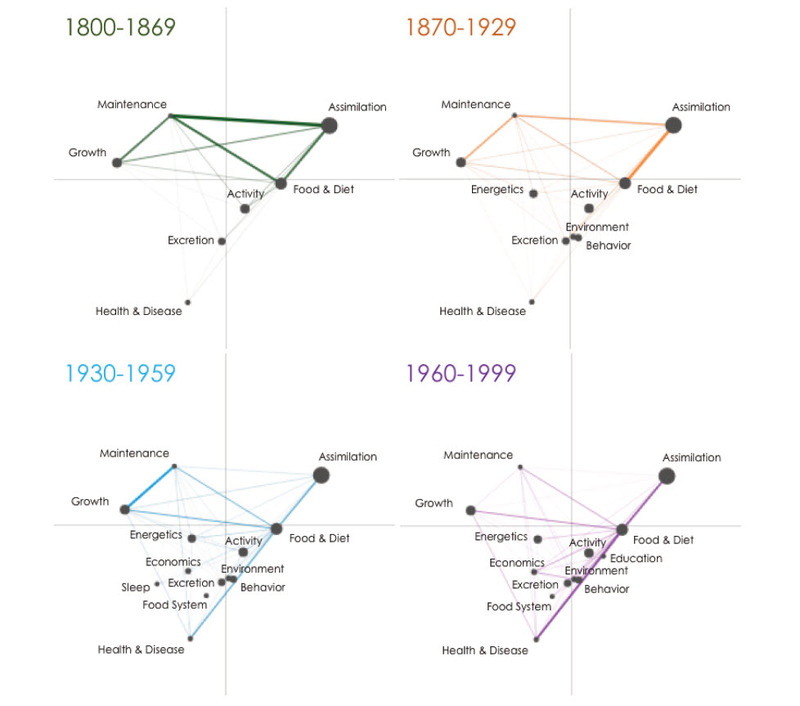 Mean ENA networks of nutrition definitions from four time periods. CN: You use epistemic network analysis (ENA) in your research, what is this technique and how was it useful in this case? AR: ENA (epistemicnetwork.org) is a technique that models patterns of connectivity and enables comparison of networks both visually and statistically. In this case, I was able to construct a network for each unique definition, and then see how those definitions changed over time based on changes in their structure of connections. Because ENA can construct mean networks and conduct statistical tests to determine whether two (or more) networks are significantly different, this provided one way for me to assess the veracity of hypothesized changes over time. While other network analysis approaches, such as social network analysis, also enable comparison of networks, those comparisons don’t do a very good job of accounting for differences in the content of the networks; that is, they only compare structural features, which is much less useful when what you care about are changes in things like the relative strength of different conceptual relationships. In addition, every connection in an ENA network model is linked to the original data that generated it, allowing exploration of my qualitative data from within the model itself. This helps ensure that the model is an accurate reflection of qualitative interpretation and opens up new ways of thinking about and interacting with source material. CN: How do libraries support the kind of research you do? AR: Libraries are essential. I built my dataset by hand, which required poring through nutrition text books and treatises, medical books, and other literature both in online collections (digitized, primarily, by libraries and archives) and in actual libraries. Read Andrew Ruis’ article in Viral Networks: Connecting Digital Humanities and Medical History, comprising a collection of research papers resulting from the Viral Networks workshop, now available from VT Publishing and NLM Digital Collections. Andrew Ruis’ presentation is part of our ongoing history of medicine lecture series, which promotes awareness and use of the National Library of Medicine and other historical collections for research, education, and public service in biomedicine, the social sciences, and the humanities. All lectures are live-streamed globally, and subsequently archived, by NIH VideoCasting. Stay informed about the lecture series on Twitter at #NLMHistTalk.